Edited by Professor Kevin Banks, with the assistance of Brian Burkett and Jeffrey Sack, Q.C., the Canadian Labour and Employment Law Journal provides in-depth analysis of key issues in labour and employment law. It also provides timely commentary on major legislative and case law developments. Designed for academics, adjudicators and practitioners, the Journal is in its sixteenth year of publication, appearing three times a year in softcover format, with an annual hardbound volume included in the subscription price. Notably, the CLELJ was recently relied on by the Supreme Court of Canada in the most significant labour law case in decades — B.C. Health Services — in which collective bargaining was held to be a constitutionally protected activity under the Charter of Rights and Freedoms. In another seminal decision, dealing with the duty to accommodate — the B.C. Forest Firefighters (Meiorin) case — the Supreme Court cited with approval five articles from a single issue of the Journal. Canada’s foremost journal in the field of labour and employment law, the CLELJ has recently been admitted as a member of the prestigious International Association of Labour Law Journals, comprising the world’s top labour law periodicals. A table of contents from the current issue, Volume 18-1, is available here ( PDF). A subscription to the Canadian Labour & Employment Law Journal is $235 + GST in Canadian funds for 2 issues per year plus a bound volume. Order online or contact Lancaster House at (416) 977-6618. The Canadian Labour and Employment Law Journal is a refereed, scholarly review with an established readership among researchers, practitioners, adjudicators, and policymakers. We welcome the submission of articles and comments on matters of current and long-term importance, and reviews of recent books. Upon receipt, submissions are reviewed by the editors. Before an article is accepted, it is externally assessed on an anonymous basis. Comments may also be externally reviewed. Among the factors evaluated are originality of approach, significance of the subject matter, depth and clarity of analysis, and quality of expression. Acceptance may be conditional upon the making of revisions by the author. We edit all papers before publication, and authors may review editorial changes. Unless the author advises otherwise, submission of a paper implies that it consists entirely of original unpublished work and is not simultaneously under consideration for publication elsewhere. Authors who write on matters in which they have been directly involved should state the nature of their involvement. Length should not normally exceed 10,000 words for articles, 5,000 words for comments, and 3,000 words for book reviews. Citations should be in footnotes, in the format set out in the Canadian Guide to Uniform Legal Citation, 7th edition. 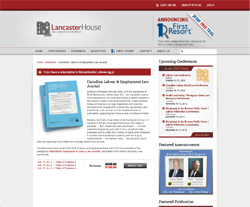 Please email submissions to the Canadian Labour and Employment Law Journal, at clelj@queensu.ca.